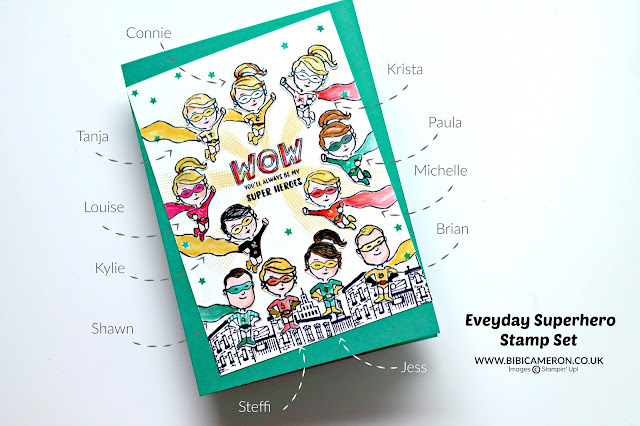 Today I'm saying goodbye to my beloved "Global Design Project Team" after 73 amazing creative challenges and I have used "Everyday Hero" stamp set by Stampin' up! as it feels so right for the occasion... I wanted to make a card for my team and include them all in a very special way. I still remember our first challenge because it went live on September 7 (2015) the day of my birthday... I couldn't have a better birthday present than having the honor to serve to the stamping word together with stamping superstars! PLOP! Thank you, my dear team, for your friendship, support, love and for teaching me so many different things and more importantly the power of networking. I love you all! I just think that it is time for me to fly. I'm willing to explore other dimensions in our fascinating crafty word ... and in the post here I explain my reasons to leave Stampin Up! For now, lets rock with another challenge. This week we have an amazing colour challenge for you to enjoy or participate! 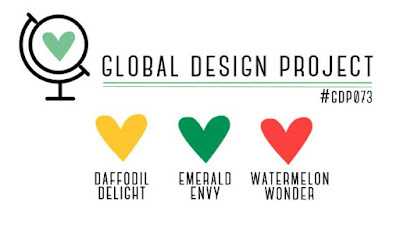 we are making projects with Daffodil Delight, Emerald Envy and Watermelon Wonder. Simply click here or in the image below to be redirected to the challenge main page. For this card, I applied a faux mirror image technique. When stamping the image of the superhero body ( the one which is flying), this is facing to the left and I needed some heroes coming from the right so I simply stamped the images on Whisperwhite Cardstock. I place the images facing down on a light box and trace them using a super fine black pen. I also thought that could be nice to add the initial of each one name on the chest of the super hero and inside the card the cape with mine as a symbol of my farewell. Make sure to come back on Sunday February 12-2017 (8pm UK time), I'll be having my Stampin' Up! farewell with a giveaway and everybody can participate! That's all! I hope you enjoy this project and do not hesitate to ask any question or leave a comment. I would love to hear from you. All the best with whatever the future holds. I can't tell you how sad this makes me for the team Bibi, but how excited I am for you! I am sure going to miss your amazing design creations each week with GDP. I can't wait to see what your new path is going to offer us! 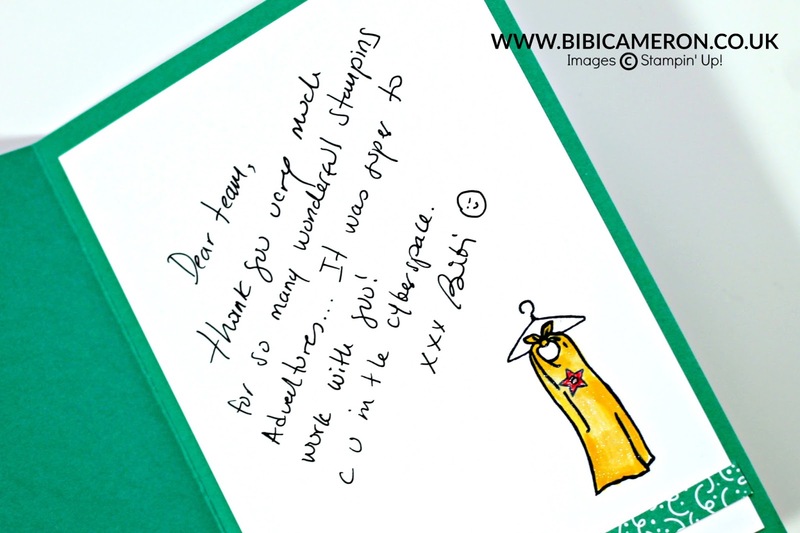 I love your card, such an perfect (if time consuming) way to say goodbye. I only wish I had a paper copy to keep! How fun and a clever way to say good-bye! 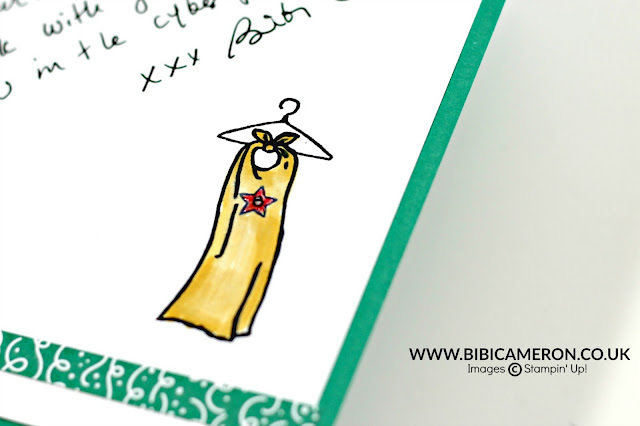 I loved the special little touches you add to the inside--hanging up your cape! So stinkin cute! 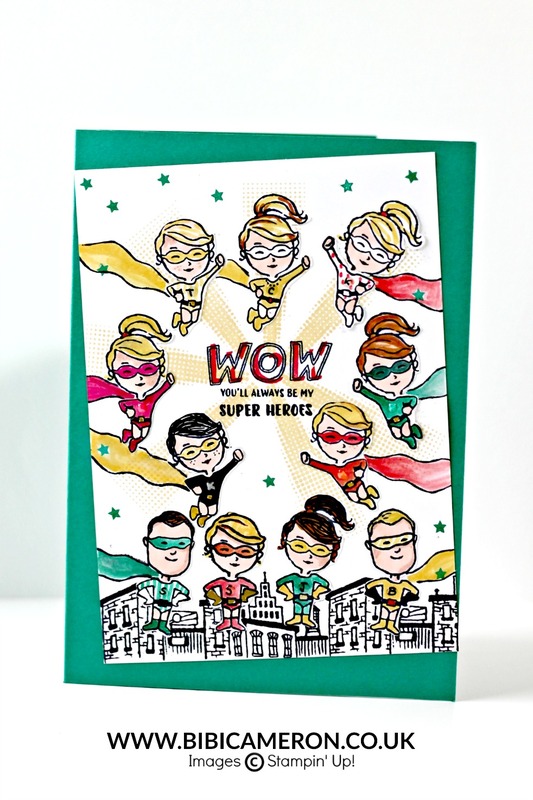 loving this card and loving you! best of luck lovely!